The TI-nspire calculator has many useful tools. From graphs to spreadsheets to histograms to integrals, the Computer Application System makes the calculator more computer like. The measurement tools in the graphing function make analyzing trig functions a useful activity. Students could investigate the different properties of he graph, for example, measure the amplitude, frequency, and horizontal shift and match those values to the general equation of a sine function y = asinb(x-c)+d. The software on the computer also makes it nice to put up on a projector for the students to create a class wide activity or add to a lecture. There are many other features that are helpful for students. The ability to transfer data from a spreadsheet on the computer to the calculators can make analyzing data easier. Students can save time by not having to input all of the values into the calculator. There are also quick ways to represent this data graphically or analyze this data. These calculators open up a ton of possibility for the classroom. How long are Yellow lights? I was walking home from the Gym and was waiting for the light to change at 4th and Peabody so I could cross the street. I noticed, the shortest yellow light I've ever seen. This got me thinking, are yellow lights supposed to be a certain length? How close would you have to be in order to stop in time? 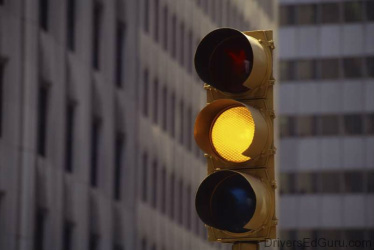 What is the average length of yellow stop lights? There could be data collected on yellow lights, students could calculate the average, solve for the distance away from the light one must start breaking, and even analyze a certain number of tickets issued by the police in the area and calculate how much money they make on tickets. I think that this can be a very interesting lesson for many students especially since students encounter yellow stop lights daily and with the rise of red light cameras, it could create an interesting context. This can be done in class, with data collected by myself, or students could also contribute data to the classroom as a project outside of class. Research Project on the "Flipped Classroom" Model and creating videos or podcasts. The notion of the "Flipped Classroom" model came to my attention while taking this course. At first glance, this seemed like a great tool for teachers to maximize student learning. I watched a few videos, read about a few teachers using it, and all seemed positive. Teachers could use these videos as homework assignments to truly provide more differentiated instruction for students during the class period. I believed all of this until i started to do some more, deeper research on the uses of the khan academy website. An article written by Steve Miranda has a ton of great points as to why Khan Academy is a good classroom tool, not a revolution for student learning. The main point that he wrote about that got me thinking was that, how is this really any different then a teacher standing up in front of class spitting out information that students don't care about. He also quoted a friend with a PH.D in physics that stated "It's like getting a lecture from someone who got an 'A' in an introductory physics course rather than someone like me"
He states that "But to suggest that this is a revolution—or that it will have even a modest impact on our overall education system—is pure delusion." and also, "Ask any classroom teacher. Undoubtedly, many appreciate this new resource—it’s yet another tool they have available to them—but I suspect the overwhelming majority of them will tell you this does not solve the most important issues they face in trying to reach students." Of all the research I did, this was the one person who pointed out the negatives to the Khan Academy. There are many teachers who have implemented the "Flipped Classroom" model of teaching and have positive things to say about it. Johnathan Bergmann and Aaron Sams, two teachers from Colorado who have implemented the Flipped Classroom Model in their own classroom claim that Flipping "Changes student interaction: teacher to student and student to student as well as the way they talk with parents. Their communication with parents is more centered around the learning of the students, rather than behavior. Khan Academy, run by Salman Khan, reportedly tripled their unique users to 3.5 million. This article quotes, "For those unfamiliar, Khan Academy is, as John Batelle noted this afternoon, one of Bill Gate's Favorite Educators." I think uTipu is my favorite one on this list solely because of the voice over . Many of the time there are things we want to say differently and on all of the other software, we would have to re-record the video. Your mouse is also followed by a yellow dot so it is easy for students to follow. The only downfall is that it does not record in HD unless you pay for it. I would also recommend cam studio because you have the ability to go back and make annotations on your video. The draw back of Cam Studio is that it is not compatible with mac operating systems. I have personally used Screenr and am satisfied with the outcome. The video and audio you record is the video and audio you are stuck with. You could use an external program to add to it if you wish. For a mathematics classroom, i would choose to use a screencast instead of a podcast for classroom purposes because it provides a visual which, in my opinion, is necessary for teaching mathematics.